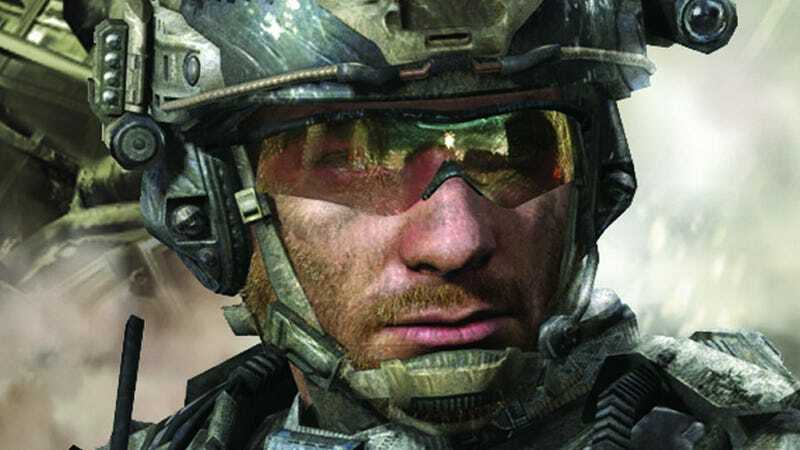 Two player cooperative gameplay pops in Call of Duty: Modern Warfare 3's Survival Mode, shown to press at the E3 Expo today. In the new mode, one of several coop modes coming to Activision's fall shooter, players have to survive increasingly difficult waves of enemies. Infinity Ward's Mark Rubin joined me for my session of Survival Mode. Rubin pointed out that players can level up their coop characters with earned experience, but that the cash and experience earned in these cooperative modes don't in any way effect the characters used for multiplayer online gaming. The enemies spawning into the level start out as fairly basic threats, in our case it was a team of men armed with shotguns. We started with just pistols, but once we had downed a few of the enemies we were able to grab the weapons for ourselves. Enemies don't have a set spawn point in any map, instead spawning tactically based on your current position. They're always going to spawn far enough away to be able to approach you from a tactically advantageous path. As the enemy waves begin to increase in difficulty and size, Rubin pointed out three icons hovering on the screen. The pistol icon directs players to an armory where you can purchase new weapons, upgrades and ammo, all purchased with cash earned with kills. The grenade icon gives you access to equipment, like a turret. (You can only have two turrets set up at a time on a map.) Finally, a plane icon allows players to purchase air support. After switching out for a rifle, we made our way over to that grenade icon, where I purchased a turret. Setting up the turret in a corner with three paths leading into it, Rubin and I stood behind the turret, gunning down enemies as they poured in from a door, a path and an underground area. After making it through a few more levels, a new type of enemy started charging at us: suicide bombers. The men, wearing vests with blinking red explosives explode a few seconds after you shoot them down, or if they get close enough to you. Levels also included attack dogs... and attack dogs rigged with explosives. With enough cash saved, we made our way over to the support icon where I purchased a Delta Team. Tied to my directional pad, when I selected it it called in a squad of four Delta Team members who fast-roped from a helicopter into the map. They spent the rest of their relatively short lives providing support fire as we took on the waves of enemies. I lost half of them in a wave that included attack helicopters that needed to be gunned down. By the time I lost all four I had enough cash to go back and purchase a group of men armed with Riot Shields. But I never managed to use them. By wave ten the enemies charging at us were backed by a single "juggernaut", an enemy wearing what looked to be an EOD bomb disposal suit. We emptied clip after clip into him, finally taking him out, but were finally both killed by the men that came with him. Players are able to revive one another, it looked like you have about a minute to get to your coop buddy before he or she bleeds out. Rubin tells me that the juggernauts in the game come in many different styles, each with their own unique weaknesses. The waves will always build the same way, so players will be able to start to come up with strategies to survive further and further into the mode. The mode will also include all the maps that are playable in multiplayer, which holds true for future maps released as DLC. So if a new multiplayer maps comes to the game, it will automatically also be supported in survival mode.